MIDDLE GRADERS: At times when you’re sad or grieving, rather than needing to laugh, it could be better to delve deep into your grief to find what you need. Perhaps you’ll read the perfect book at the precise moment you need it. 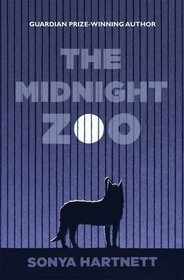 “Midnight Zoo,” by Sonya Hartnett (Candlewick 2010) was that book for me. This haunting story broke my heart, then lifted me up. Andrej, twelve, is a “Rom” or Gypsy boy traveling through war-torn WWII Europe with his brother Tomas, nine. They guard a mysterious bundle, traveling under cover of night. Andrej’s father had told him, it’s not our war, it’s the “gadje” war, don’t worry. Yet for some reason the Nazis hated Gypsies. So, the story is told from a point of innocence—not just the innocence of a child, but from a culture outside of the warring culture. Andrej remembers his uncle saying, We gypsies are wildcat people. The earth and sky belong to us. The brothers, escaping the Nazis, find a small zoo in a bombed out town. The caged animals are in need of hope, as are the boys. The animals communicate, but rather than being sentimentalized, they are cantankerous and seem true to their wild behavior. The animals are dangerous, but don’t they deserve to be freed? Young Tomas’s major concern is the unfairness of life and his proposed solutions are childish. Andrej who is leaving childhood behind, thinks, “Sometimes…being courageous was the least safe thing in the world.” But to overcome your fear is what living is. Both the human and animal characters explore profound ideas. Life is a battle fought alone. Why does war happen? Because humans WANT something. And nothing is more important than that wanting. Andrea Offerman’s cover art has the animals looking at you imploringly, as if asking, can you be the one? And you, the reader, want to be the one–who will help. Patricia Hruby Powell (www.talesforallages.com) is a nationally touring speaker, dancer, storyteller, librarian and children’s book author. What separates Rom children from gadje children?